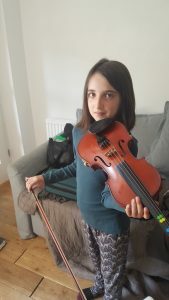 Recently, I posted on my Instagram account a picture of my daughter practising the violin. A mum then asked me how I have introduced my children to music. I don’t play any instruments myself although I so wanted to learn the piano when I was a child. Anyway, to respond to that question, I have taken the time to reflect on how we have introduced our children to music. Although I don’t play an instrument and that I cannot sing on a tune, I enjoy listening to music and I enjoy singing my favourite songs, all day long. When I was pregnant with my first, I was working in a nursery with toddlers. We were singing nursery rhymes every day and I believe that my daughter was well used to those songs and her mother’s out of tune voice. In addition, I used to sing her some of my favourite pop songs of the time. In particular, I enjoyed an album by Mika. When my daughter was born, I kept singing those songs and I could see the calming effects it has on her. I really enjoyed dancing and singing with both my children from a very young age. It’s something that I still do if they indulge me. I would put on some positive songs on and dance like no one is watching. I have fond childhood memories of my parents dancing a rock or my dad rocking with me, I used to put my feet on his feet to learn how to rock. Early on, I selected a few music CDs to listen to classical music for babies and traditional nursery rhymes and finger songs. We also enjoy all kind of music in our home, including the world music CDs by Putumayo. I quickly came upon Kindermusik classes and we attended those classes for a year with my daughter and even longer with my son. Those music classes, contrary to many baby and toddlers classes, were peaceful and suited my children’s development. 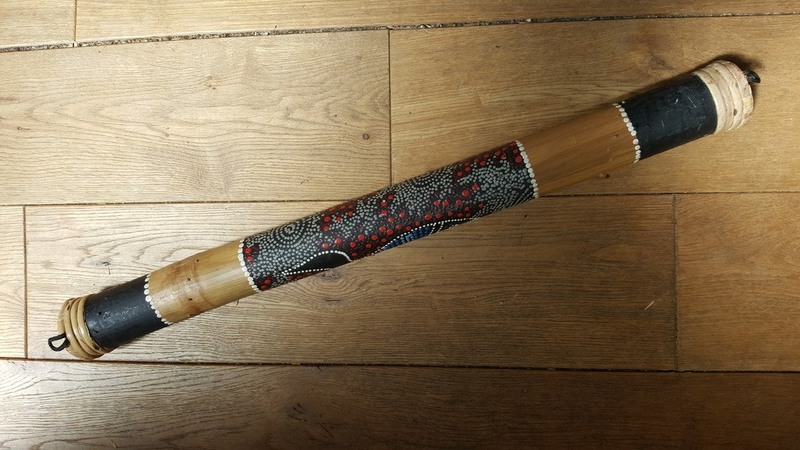 It’s a nice way to introduce children to music, other cultures, instruments and dancing too. I have 4 CDs and the music and songs are so nice that we still enjoy them. In my playgroup, I end the session with nursery rhymes. We use puppets and or musical instruments. I found some puppets second hand and we have this nursery rhymes set. The songs are familiar for the child and they really enjoy the repetition. 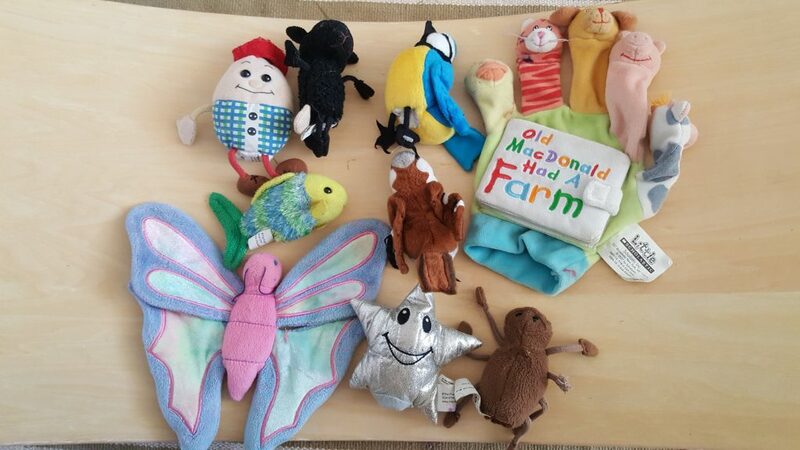 A basket of nursery rhyme puppets will encourage your child to sing with or without you. 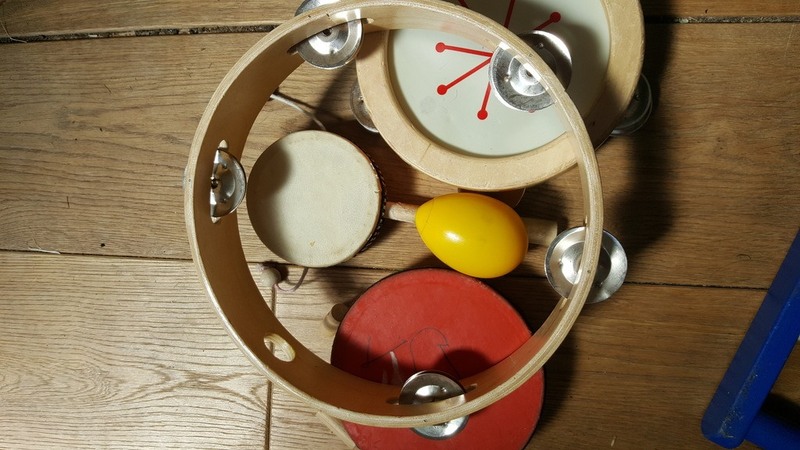 When my children reached toddlerhood, I had a basket of musical instruments available for them. Sometimes, it was available on the shelves, at other times, I would take it out only for a specific music and singing session. 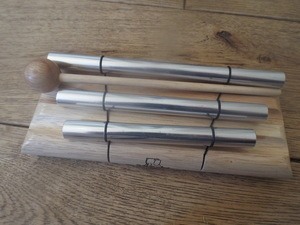 I have purchased this set of wooden instruments. It’s not on sale anymore, sadly but this is a similar set from Haba. Then I found many in charity shops. 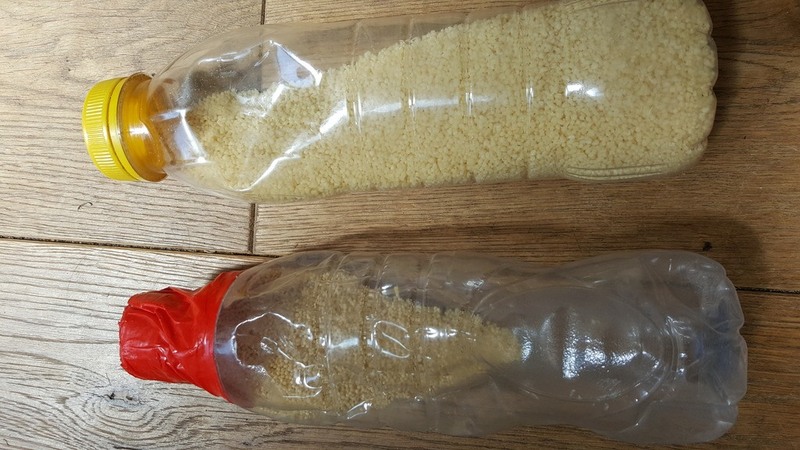 You can also make some shakers by filling plastic (or glass) bottles with various dry ingredients or small items. 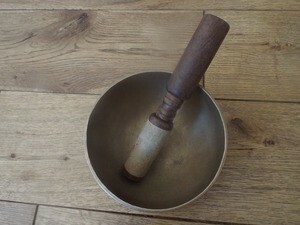 I also use a Tibetan bowl and a chime to take some deep breaths and to bring calmness after an exciting play session. Children enjoy feeling the vibrations of the Tibetan bowl. That one is quite big and heavy, so I need to supervise the children closely when they use it. I’m planning to buy a small one that they could use themselves. We have also this beautiful rain shaker. It is quite long so young children need support to manipulate it. I generally demonstrate or use it when children are in “relaxation” during my yoga classes. semi-tones of one octave. To work with the bells, the child is required to pair off the bells that produce the same sound. 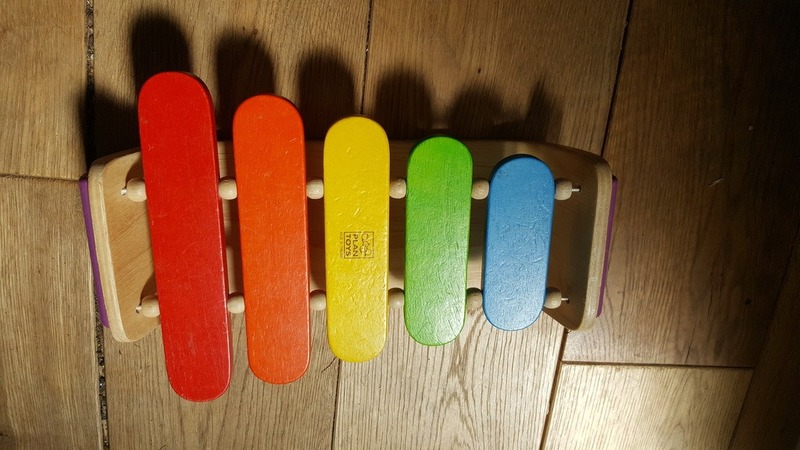 This enables the child to learn how to discriminate, eventually learn how to arrange the bells in gradation, and to play the musical scale. An alternative would be to provide 2 pairs of musical bells and encourage your child to pair them by ear. That can be a great blindfolded activity. To help a child to refine his auditory sense, you can provide cylinders containing various dry ingredients and ask the child to pair them. 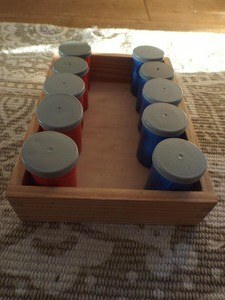 Each pair of cylinders makes a different sound in a range from loud to quiet when shaken. The child has to find the matching pairs by carefully listening to the different sounds made. At a later stage, the child can grade the cylinders from loudest to quietest or vice-versa. I made my own set using film canisters. You can also purchase the sound boxes already made. Playing the King of Silence, Sleeping bunnies or other silent games help the child to learn patience and concentration. Many teachers first introduce the Silence Game when the whole class is gathered, in order to explain and practice the game. Older children can model how to get up, ever so quietly, and go to the teacher once their name is called. Some teachers choose to hold up a card during the work period that reads “Silence” and then wait, as one-by-one, the children notice, stop working, and become still and silent. Some teachers encourage the children to close their eyes. Then the teacher goes to a far corner or walks out of the room to whisper the children’s names. When a child hears her name, she goes over to the teacher and sits near her. When all of the children have heard their whispered names and come to you, you might want to take them outside for a celebratory walk in the garden. Be creative and vary the activities you do after playing this game: group singing, a birthday celebration, or simply a return to work. Today we live in a noisy world, filled with the sounds of the television, electronics, phone conversations, leaf blowers, sirens, and traffic. Many of us rarely have the opportunity to experience silence or to savor the quieter sounds of bees buzzing, wind rustling the leaves, or a fire crackling in the fireplace. The Silence Game can give children a precious gift that could last a lifetime: the ability to cultivate and appreciate silence. I had no idea if my children would be interested in a musical instrument. I knew I didn’t want to push them but at the same time, I wanted to offer them the opportunity. We went to an open day in our local music school when my daughter was 4 years old. She tried several instruments and showed a keen interest. Unfortunately, the waiting list was long and we never get a chance to try the school. When we moved to the countryside, she was 7 years old. And I found another music school and asked her if she wanted to try. We visited and again, we explored various instruments. She chose the guitar and the keyboard. She showed an inclination straight away for the keyboard and despite, having no prior experience, she reached an advanced level within a few months. She didn’t enjoy the guitar so we dropped that instrument and we moved her to a private piano teacher. She rehearses because she wants to. We don’t impose anything and we only support her interest. When violin lessons were introduced in her school, she tried and enjoyed that instrument too. So she added the violin lessons. She was nearly 9 years old. She is now ready to take on the first level exam in both instruments. But we are in no hurry and we are waiting for her to say that she is ready. This is something that she will decide with her music teachers. My son is 6 and could start piano. So far, he doesn’t want to. We have a keyboard at home and he doesn’t show any interest. Although we enjoy music on digital media, an old fashion CD player is a good way to let your child plays the music independently. Your child can choose when and what to listen to. We have also this vintage Fisherprice record player that I’m going to introduce to the toddlers in my classes. 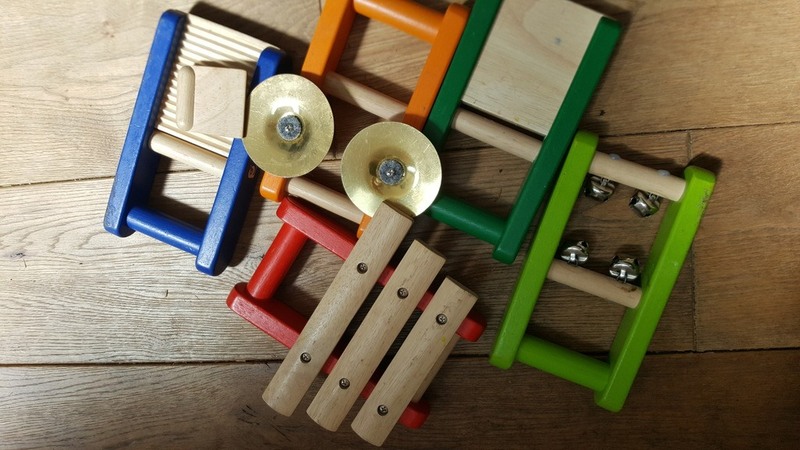 I hope these ideas will help you and your child to enjoy music together. This blog post contains affiliate links at no extra costs for you. Thank you for supporting my playgroup!